Too many New Yorkers cite Babbo as their favourite restaurant for it to not be amazing and, sure enough, the little Italian on Waverly in the Village doesn’t disappoint. A short walk from Washington Sqaure Park, the restaurant doesn’t look like much from the outside but chef Mario Batali serves up food with big flavours and traditional favourites but with an energetic atmosphere – maybe down to the clientele or the music – think Led Zeppelin while you eat. Sound bizarre? It is worth booking in advence so you don’t miss out. I was staying by the University and was surprised at how many amazing restaurants there are in the vicinity – considering the people who live around there are students. My friend Sean lives around the corner from Babbo and said that, although it is really quite expensive, it is worth the money and, for a special occasion, you can’t get better food. It is good to have some pointers when in New York – there are so many restaurants to choose from and the more pretentious ones have massive prices and don’t always deliver on the food front. 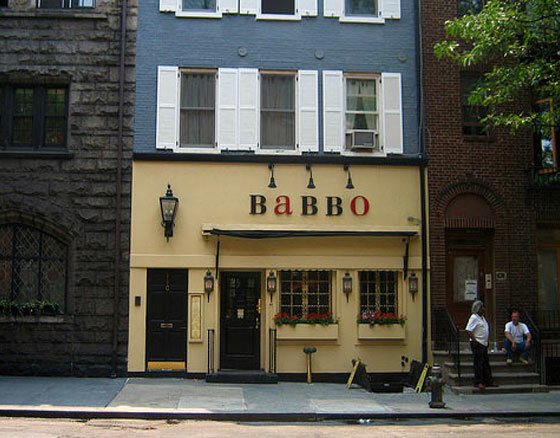 Babbo is genuinely a fabulous place to eat and have a great night out of music and atmoshpere. The whole package. The menu changes nightly, which is rare for any restaurant. The only thing that Batali ensures is that the ingredients are the best and freshest seasonal produce available – think incredibly Italian cheeses, meat and seafood as well as fine Italian olive oils, aceto balsamic vinegar and an extensive and impressive wine list, presided over by beverage director David Lynch (no, not the film director). Despite not being able to predict the menu, such is its diversity, there are delicious things such as Roasted Beef Tartare or Steamed Cockles for antipasti, followed by Goat Cheese Tortellini or Chianti-Stained Pappardelle with Wild Boar Ragu to start and a main course that includes rabbit, quail, pork, steak and pretty much anything else you can think of. Book now to avoid disappointment – the restaurant only seats 90 and is generally full every night.